Jacob Taylor as newsboy and Karin Taylor as Delia Beardsley at 2014 Cemetery Walk at the "Old Burying Ground". 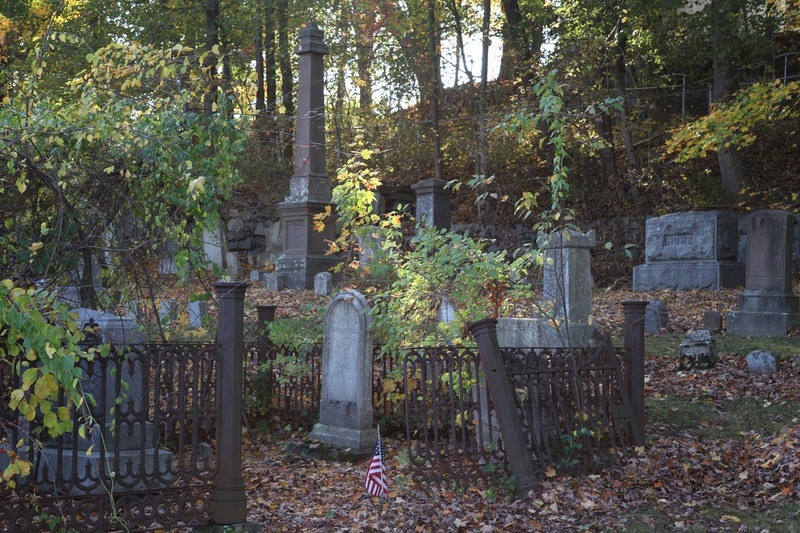 The 2015 Cemetery Walk on October 24th will explore the same cemetery located across from the town green. The 2014 Cemetery Walk was a huge success! The accolades and donations came pouring in for quite some time! A photographer/graphic designer who attended the event was so stunned by the atmosphere of the old cemetery and the realistic portrayals of the persons depicted that he took hundreds of photographs and gave us many of those to use in our future promotions. If you saw the Charter program on the Cemetery Walk you will have noticed the eerie, yet beautiful, opening photograph that he designed. By the way, a copy of the program is available at the library to circulate. Just ask a librarian at the circulation desk. Also, be sure to "save the date", October 24th for our 3rd annual Cemetery Walk, which will again be held at the Central Cemetery known as "the Old Burying Ground". There are many more important and fascinating characters that we have yet to portray!